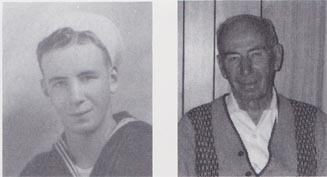 Robert W. Wilson, Lieutenant Commander, born April 29, 1915, Milton, ND; attended high school in North Dakota; Navy, five term student, University of Louisville; joined the USN Aug. 17, 1934, Minneapolis, MN. He attended boot camp at San Diego, CA; served aboard the USS West Virginia, November 1934-April 1939; received orders for Asiatic Fleet; USS Black Hawk, five months; and the USS Mindanao (PR-8), November 1939-April 1942. He was captured on Corregidor, Philippine Island on May 6, 1942; Cabanatuan Camp #3, June 1942-November 1942; Cabanatuan Camp #1, November 1942-Aug. 18, 1944; embarked on NOTO MARU Aug. 25, 1944, and arrived at Moji, Japan Sept. 4, 1944; arrived Tackioka City, Western Honshu, Sept. 8, 1944, Nagoya #6 Camp. There were only 150 Americans at this camp at first; some British joined later. They worked in Manganese smelting plants; and returned to US control in late August 1945. Most memorable experience was surviving as a POW for three years and four months; also his first Navy division officer on the USS West Virginia was Lt. Blinn, F Div., he was senior naval officer in their camp in Japan (full commander). He was the commanding office of the USS Pope that sunk in March 1942. He attained the rank of lieutenant commander (SC) USN; requested voluntary retirement for Aug. 1, 1958, with 24 years of active service. Awards include the Korean Service Medal, National Defense Service, Good Conduct (three awards), American Defense w/Fleet Clasp, Asiatic-Pacific, WWII Victory, Philippine Defense, Army Unit Citation, UN Service and Philippine Republic PUC Badge. Married Elsie in April 1939 and has two children, Wendy Ann and Robert S. and four grandchildren. They have lived in Boise, ID since 1958.